More than 38,000 people recently sent congratulatory messages to the New Horizons team through the White House Office of Science and Technology Policy website. The following message from New Horizons Principal Investigator Alan Stern went out to each sender on July 24. From the New Horizons team to the entire nation who supported this incredible exploration of Pluto – thank you! The epic, first exploration of Pluto and its moons by NASA's New Horizons mission was completed last week, on Tuesday, July 14. And it captured the attention and imaginations of people across America and the entire world. New Horizons is truly an American-made product, and one we can all be proud of. More than 2,500 Americans worked to design, build, launch, and fly New Horizons. This NASA-industry-academia team included major partners at the Johns Hopkins Applied Physics Laboratory, the Southwest Research Institute, Ball Aerospace, Boeing, Lockheed Martin, United Launch Alliance, KinetX Corporation, Aerojet Rocketdyne, Stanford University, the University of Colorado, and the Jet Propulsion Laboratory, as well as dozens of other universities and small companies who contributed. The people who created New Horizons to complete the first reconnaissance of the planets delivered on the promise we made in 2001 to explore the Pluto system. We invested 15 years of our careers and lives to do this, to create knowledge, to show the United States on its game, to inspire kids and adults alike -- across the world -- and to make you proud. In addition to gathering incredible science, one of my hopes for the flyby was that we'd excite people about the power of exploration, the sheer audacity of our species, and the great things we can achieve. And it's working -- from an unprecedented response on social media to global news coverage, the exciting and historic nature of New Horizons has really caught on! It took us more than nine years to cross the 3 billion miles of space to get to Pluto -- and you have followed our journey, supported us, and believed in our mission. We can't thank you enough for that, or for your support of NASA that made New Horizons possible. 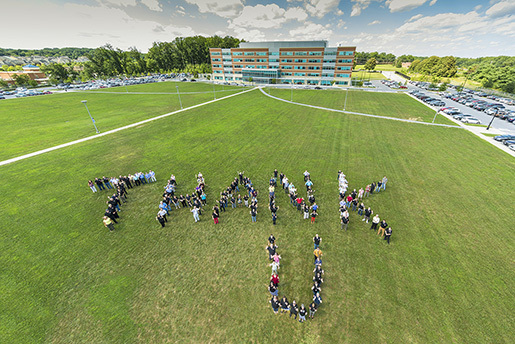 The New Horizons team spells out a token of their appreciation at the Johns Hopkins University Applied Physics Laboratory in Laurel, Maryland. Please continue to follow the mission at www.nasa.gov/newhorizons and http://pluto.jhuapl.edu.